Bexhill United Football Club heads into its final home game of the season with its quest for a promotion place back in its own hands. The Pirates remain third in Southern Combination League Division One, with the eventual champions and possibly the runners-up to be promoted (depending on points per game averages and complying with FA ground grading regulations). Bexhill are now just three points behind leaders Alfold and two back of second-placed Steyning Town after Alfold drew and Steyning lost while Bexhill won 6-0 at Wick last weekend. All of the top three teams have five matches remaining and the third of Bexhill’s five is away to Steyning on Easter Saturday. 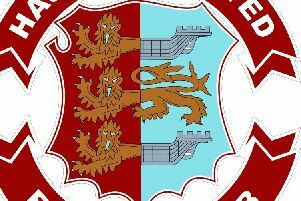 Bexhill will host sixth-placed Littlehampton Town today (Saturday) before contesting away matches against Midhurst & Easebourne, Steyning, Hailsham Town and Mile Oak. “We’ve got a really tough game against Littlehampton on Saturday,” Light went on. “If we could come through that, then we visit Midhurst, who are down near the bottom. “If we can get the two wins and go into the Steyning game with another six points in the bag, that will really be some afternoon. Bexhill are offering free admission to today’s game as a thank you to supporters for their backing over the season. Kick-off at The Polegrove is 3pm. “You have to reward your loyal supporters,” added Light. “I think we’re sixth or seventh in attendance out of all the teams in the league and second in the division. Kion Parchmont is away in Cyprus for the next two games, so Georges Gouet will be included in today’s squad. Southern Combination League Division One top half standings (played-points): 1 Alfold 27-65 (+46 goal difference), 2 Steyning Town 27-64 (+42), 3 BEXHILL UNITED 27-62 (+61), 4 AFC Varndeanians 26-55 (+31), 5 Selsey 28-54 (+28), 6 Littlehampton Town 27-41 (+4), 7 Hailsham Town 28-39 (+7), 8 Wick 27-36 (-13), 9 Sidlesham 28-34 (-13). Remaining fixtures - Bexhill United: March 30 Littlehampton Town (h), April 6 Midhurst & Easebourne (a), April 20 Steyning Town (a), April 22 Hailsham Town (a), April 27 Mile Oak (a). Steyning Town: March 30 Hailsham Town (a), April 6 Southwick (h), April 20 Bexhill United (h), April 22 Worthing United (a), April 27 Littlehampton Town (a).